For many of us, the annual shoulder-jab with the flu vaccine is as much a rite of winter as digging out the parka and snow shovels. Twice a year, the World Health Organization (WHO) reviews flu strains around the globe and recommends a vaccine for the coming season. Private companies then produce those vaccines for use around the world. The Manitoba government makes the flu vaccine shots available free of charge. The vaccine is designed to buttress our individual defences. The greater the number of people immune to a virus, the fewer hosts there are to spread it. That is not only good for the health of individual Manitobans, it also benefits the economy. Not only does the flu vaccination campaign reduce absenteeism in the workplace, it also ensures consumers are out there spending their money on coffee, gasoline and Big Macs instead of lying flat on their backs with a thermometer between their lips. The vaccine program also keeps hospital beds open for patients who really need them, and results in fewer cancellations for elective surgeries. But it was a much different scenario a century ago. 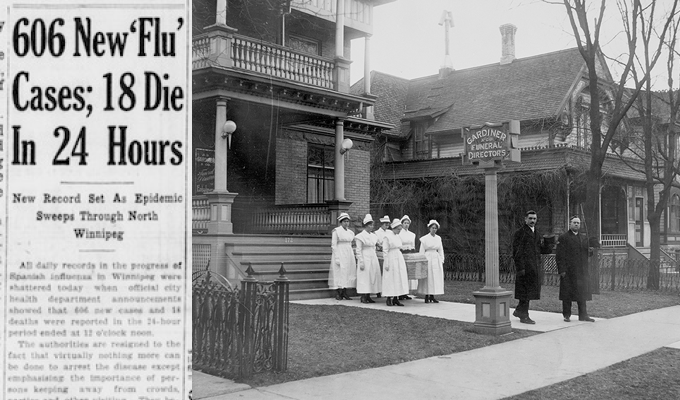 The flu season was considered to be a regular winter experience back then and wasn't taken that seriously. The Spanish flu in 1918-19 changed that. It would prove to be the deadliest pandemic in human history. More people died from Spanish flu in a 15-month period than from the bubonic plague pandemic of 1347 to 1351, also known as Black Death. There was nothing to stop the Spanish flu. One-third of the world's population contracted it, and between 50 million to 100 million died. About three-quarters of the deaths happened about a hundred years ago, in the last four months of 1918. Within three days of contracting influenza, a person could be dead. There are anecdotal reports of people who went to bed in apparent good health and never woke up. From all walks of life, across all socioeconomic lines, people were literally dropping like flies. Although there is no general agreement on the pandemic's origins, some historians and health experts have speculated that it could have started in France, Great Britain, Asia or possibly the United States. What everyone does agree on is that it didn't originate in Spain. According to an article published in the journal Clinical Infectious Diseases, it is generally accepted that Spain became associated with the flu largely because it was a neutral country during the First World War. As the article explains, the countries at war did not allow their newspapers to report on the flu outbreak, fearing it might lower morale among the troops or give the other side some advantage. The uncensored Spanish newspapers, meanwhile, had more freedom to report on the flu as it started to move across Europe, and did so, especially after the virus struck a number of people in Spain, including its king, prime minister and members of the cabinet. Whatever its origins, experts believe the flu's spread in North America was aided by soldiers travelling to and from the war. It was during the dawn of modern travel, with ribbons of railway crossing continents and ocean travel on the rise. That's the scary part when considering a pandemic today; the volume and speed of travel in the modern world has soared, making the ability of a pandemic to spread ever greater. While there was much hand-wringing over reports of the deadly flu in other parts of the world - an outbreak in March, 1918, at Fort Riley, Kansas, left a thousand soldiers sick and killed 46 - it had not yet reached Winnipeg by the fall of 1918. 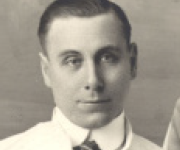 Then it was announced on Sept. 30 that 15 men on a troop train stopping in Winnipeg had contracted the flu virus. By the next day, the number had climbed to 23. They had to be carried on stretchers and quarantined at the Imperial Order Daughters of the Empire military hospital, a home for convalescing soldiers. On Oct. 7, the local press reported two deaths and two more soldiers near death among the troops. But the virus had already escaped quarantine and was moving rapidly through the general populace. Hospitals were starting to fill up and would soon be turning away patients. Health authorities started scrambling to find extra building space to accommodate the sick. Up to 55,000 people across Canada died from the Spanish flu. It killed at least 1,200 Winnipeggers out of a population of 180,000 at the time. In a church cemetery in Hochfield, just outside Steinbach, a stone memorial is dedicated to 20 children who died of Spanish flu. The population of Steinbach was less than 500 at the time. Portage la Prairie registered 400 flu cases by November. At the height of the influenza in early November, Winnipeg was reporting 700 new cases of Spanish flu every day. There is a mass grave in Sagkeeng First Nation for Spanish flu victims. In Norway House, just north of Lake Winnipeg and an important trading district at the time, nearly one in five people lost their lives. Among First Nations in British Columbia, the death rate was 46 per 1,000. These statistics are contained in Esyllt Jones's detailed and riveting book, Influenza 1918: Disease, Death, and Struggle in Winnipeg. Asian countries suffered most with a death rate of four to five times that of Canada. Between 20 and 34 per 1,000 died in Asia, versus a rate of 6.1 per 1,000 in Canada. The death toll was so great that Toronto began allowing funeral services on Sundays. Not that they were well attended. Many people avoided funerals altogether and any other place where a crowd gathered. In Saskatchewan, rural death rates were twice the province's average, with cases reported of entire families found dead and livestock starving. The age of victims was another jaw-dropping feature of the Spanish flu. Every known flu outbreak beforehand followed the U-shaped distribution curve, meaning it proved most fatal for the very young and very old. The Spanish flu had a new model. It had a W-shaped distribution pattern. It still killed the very young and the very old, but was most lethal to the healthiest segment of the population, those ages 20 to 39. With children, it was infants ages three and under who were the most vulnerable. About 150 children in that age group died from the Spanish flu in Winnipeg, while about 100 from ages four to nine died. Another 100 from ages 10 to 19 lost their lives, according to figures compiled by Jones. Meanwhile, of the 1,216 deaths registered in Winnipeg, 750 were men and women between the ages of 20 and 39, or nearly 60 per cent. The demographic was "shocking and unexpected," writes Jones. Most were mothers and fathers of young children. The Spanish flu resulted in scores of broken families. Families lost brothers and sisters, sons and daughters, mothers and fathers. Single mothers and single fathers were left behind to care for surviving children, and new orphanages sprang up to accommodate the numbers of homeless children. Unlike seasonal flus that come and go every year, the Spanish flu was a pandemic. Flu pandemics occur when a mutant strain of a virus emerges, for which most people have no natural immunity. A seemingly harmless virus mutates into a more virulent and deadly strain. There was no satisfactory explanation for the flu targeting the healthiest population until the last decade or so. Kevin Coombs, a professor of medical microbiology at the University of Manitoba's Max Rady College of Medicine, recently published findings that help explain why the Spanish flu acted the way it did. Coombs, originally from New York state, says that what drew him to study viruses is "how something so small can cause so much misery, how such a simple organism can take over a cell and force it to do what the virus wants it to do." Along with co-authors Darwyn Kobasa and Charlene Ranadheera of the Public Health Agency of Canada (PHAC), Coombs found corroborating evidence that what killed people wasn't actually the flu, but the body's overreaction to it. Coombs compares it to anaphylactic shock, a severe allergic reaction to an antigen for which people use an EpiPen to counter the body's extreme response. "It's not really the thing you're allergic to that does you in, it's how you respond to it," he says. 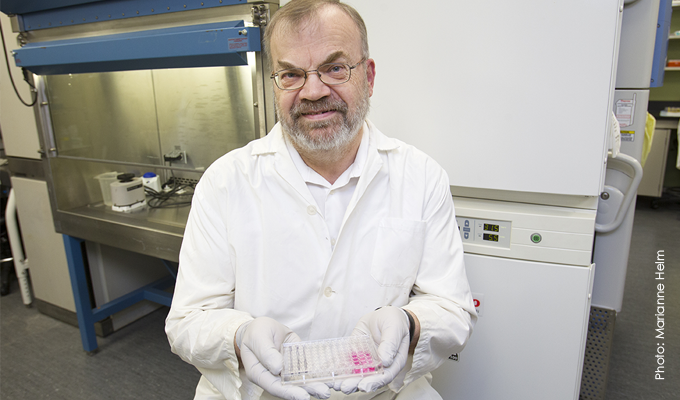 Researcher Kevin Coombs holds a plate of cells to be incubated for his research. He says people died from the Spanish flu because their immune systems overreacted to the virus. The lethal flu virus caused what is called a "cytokine storm." Cytokine is a molecule that cells use to communicate to each other. Coombs' group, making use of the unique facilities at PHAC, was the first to study how proteins communicate with each other in Spanish flu-infected cells. This begins to explain how Spanish flu causes overproduction of cytokines that then surge into the lungs and leads to a fluid buildup that becomes so great that people can't breathe. "You got so much produced that a large number of people were literally drowning in their own secretions," he says. That explains why the health of 20- to 39-year-olds was hit hardest. They had the most robust immune systems, and the Spanish flu turned those rigorous immune systems against them. The goal of such research is to find a vaccine, or "silver bullet," for pandemic flu, says Coombs. "The big thing with flu is that the virus changes so rapidly that we have to get a different flu shot every year," Coombs says. The hope is that research will find the shared trait among viruses and then develop an agent to render them harmless now and in the future. "Maybe we can find something all flus have in common and that would be common to all the flus yet to come, and then nip it in the bud," he says. Some scientists say the world is overdue for another flu pandemic on the scale of the Spanish flu. There have been reappearances of deadly viruses. Most recent was the swine flu, or H1N1, as it was also called, that claimed 200,000 lives worldwide in 2009. Swine flu had a mild version of the W-shaped distribution pattern, but the middle peak wasn't nearly as great as with Spanish flu. The Asian flu in 1957 and the Hong Kong flu in 1968-69 were deadlier, claiming about a million lives each. 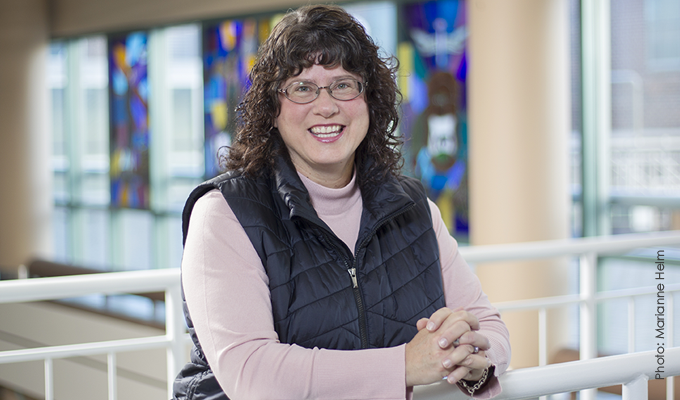 Myrna Dyck says people were unprepared for the devasting effects of the Spanish flu pandemic. But a century ago, people were no match for a pandemic, like Spanish flu. "They weren't prepared," says Myrna Dyck, epidemiologist for infection prevention control for the Winnipeg Regional Health Authority's six hospitals, as well as Deer Lodge Centre, Riverview Centre, and Misericordia Health Centre. "They thought things like the Black Death existed only in history books. They didn't realize that level of pandemic could exist again." Viruses weren't even discovered yet and wouldn't be until the 1930s. People had some sense that influenza operated on a different level than bacteria, but they didn't understand what a virus was. Antivirals to fight the flu wouldn't be discovered until 1966, almost 50 years after the Spanish flu. Antibiotics hadn't been discovered yet either. Although not effective against a flu virus, antibacterials can be used to fight bacteria. Often, influenza leads to a secondary pneumonia (bacterial infection) which can now be treated with antibiotics that weren't available then. The fluid buildup in people's lungs was a perfect environment for the pneumonia bacteria to grow. Some of the treatments at the time included using arsenic, mercury, strychnine, Aspirin, alcohol, and even bloodletting in rare cases to, in theory, purge the body of its poisons. That was a mistake because the body was already dehydrated. While people did not have a scientific understanding of the flu, they did know, through empirical observation, that it could be spread from coughing and sneezing. Even so, they wouldn't have realized just how infectious the disease was. For example, they didn't know that just coming into contact with objects that have viruses on them could transport the virus into the body via the nose, eyes and mouth. They wouldn't have known that coughing into your hand and shaking hands with someone transmitted the virus. Nor did they know that the flu has an incubation period of two days, meaning a person can be a symptom-free host for 48 hours and still transmit the infection. And, people did not have the hygienic habits or the sanitation to match today's standards. People did wear masks. Alberta made wearing a mask compulsory if you were going out in public. It was optional in Manitoba, but some citizens wore them and they were certainly worn by health-care workers. 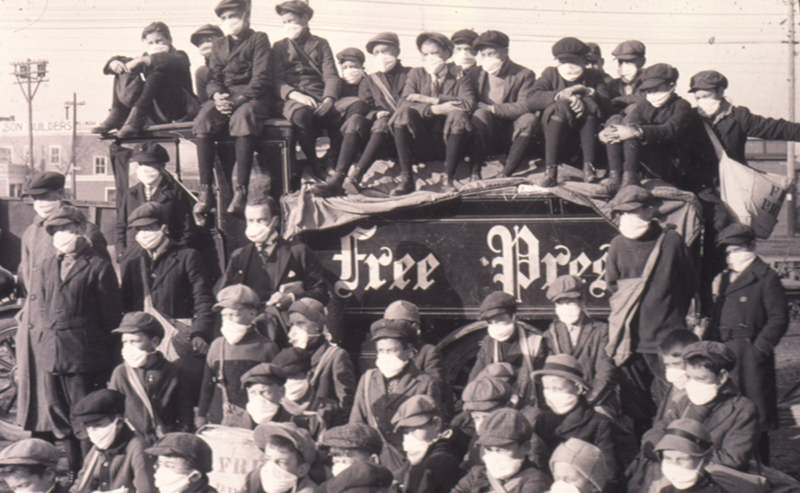 A famous photo shows Free Press newspaper carriers decked out in masks before heading out on their paper routes. But they weren't the disposable kind like we have today, and experts believe the cloth masks were literally storehouses of germs, including the potentially lethal bacteria that cause bronchitis or bacterial pneumonia. The masks worn by health-care professionals would have been washed regularly and been more hygienic. Even Kleenex hadn't been invented yet. The disposable tissue paper was still six years away. A vaccine developed by the Mayo Clinic in Minneapolis was imported and reproduced locally by Winnipeg's health authority, led by Dr. Gordon Bell, and other medical laboratories. It was widely distributed and gave people some hope, but in the end that was all it gave them. The vaccine proved ineffective. Health officials didn't know what made the flu so virulent and so lethal. The only preventive measure was to avoid being near people who were sick. That could prove difficult when family members contracted the virus. A ban was placed on public gatherings in Winnipeg. (The province passed a special order giving municipalities the ability to impose public bans.) Public buildings like schools, churches, and theatres were shuttered for 46 days. The general plan of attack against the Spanish flu in Manitoba in 1918 included educating the public about hygiene, avoiding crowds, and quarantining Spanish flu cases, although the latter was never carried out vigorously. If a Spanish flu-like pandemic struck today, it wouldn't be as lethal, but it's hard to say how lethal it would be. Today we are healthier. We have better sanitation and better nutrition. There are antiviral medicines like oseltamivir that, if taken within the first four days of symptoms, can shorten the duration and reduce the severity of the flu. Alcohol-based hand sanitizers can kill viruses and are available everywhere, including restaurants. "All of these things make us healthier and make it easier to recover from a viral infection," says Dyck. "We clean our hands and understand that doing this will make a difference - for us and others around us. I don't know how well that was understood in 1918." We're also taught that coughing into your arm - the crook of your elbow - is preferable to coughing into your hand because you're less likely to touch as many things with the inside of your elbow. Coughing into your hand only helps to spread germs. You're not likely to rub your eye or your nose with the inside of your elbow. Neither do you want to touch your face after handling money, or while on a stationary exercise machine in a public gym. At the risk of turning people into germophobes, these are practices that can help prevent the spread of the flu and are being taught to children as early as kindergarten. And, of course, today we have vaccines, which we use to contain the annual seasonal flu virus. 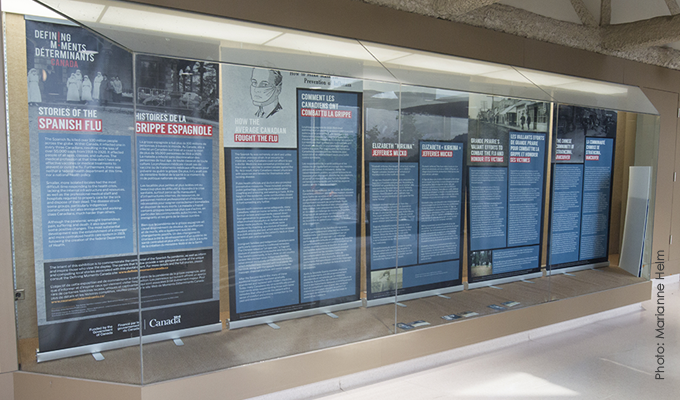 An exhibit from Defining Moments Canada marking the 100th anniversary of the Spanish flu pandemic was staged at Health Sciences Centre Winnipeg in October. It is sometimes forgotten that 46 people diagnosed with lab-confirmed influenza died in Manitoba last year. Although it is unknown if influenza contributed to their deaths, it is likely that even more people would become sick and possibly die if not for the vaccine that is distributed throughout the province. The WHO meets twice a year to review the prevalent flu virus types circulating around the globe and to determine the make-up of the vaccine that will be used for the next season. They meet in February to determine what to recommend for the Northern Hemisphere vaccine for the following season, and in September to prepare recommendations for the Southern Hemisphere for their upcoming season. Generally speaking, the goal is to create a vaccine that is effective against any particular strain of flu. More often than not, the vaccine is about 40 to 60 per cent effective. That is not bad, considering the flu virus is constantly mutating, making it difficult to produce a vaccine for the viruses that are in circulation. "It's basically because they're guessing what flu is going to be circulating six months in the future, and sometimes they get it and sometimes they don't," says Coombs. This is looking like a good year, however. Early results with this year's vaccine have been very positive so far in Australia, which gets its winter, and flu season, about half a year before us, says Dyck. "Although it is early in the flu season here in Canada, it appears the vaccine is a good match for the virus that is circulating. So the odds of avoiding the flu this year are quite good, so long as you get your shot," she says. Manitoba officials are expecting a typical flu season this year, not a pandemic as occurred 100 years ago. It is worth noting that if a pandemic broke out today, there would likely be about a six-month lag before a new vaccine could be developed and distributed to counter the more virulent and deadly strain, Dyck says. This lag would have a significant impact on the health of Manitobans. If a fatal mutation did strike this year, there would be no vaccine to deal with the milder first wave, if it follows the pattern of the Spanish flu, and it would be an extreme rush to vaccinate before a second wave. Still, one wonders what the people living in 1918 would have thought about our attitude towards the flu, seasonal or otherwise. Last year, only 22 per cent of Manitobans took up the government's offer of free vaccination. The relatively low immunization rate frustrates those working in flu prevention. Even if a vaccine in any given year isn't 100 per cent guaranteed to beat back the flu, it will still eradicate some of its components, lessen symptoms, and, ultimately, save lives. "People are concerned that it didn't work well last year. It may not have been perfect, but if you got vaccinated before you got influenza, the likelihood of you dying was a lot less," Dyck says. "It (the vaccine) seems to provide some protection from the severity of disease. It will protect you even if you get influenza." That's why Dyck encourages more people to get vaccinated. "It's free, and it could protect you."